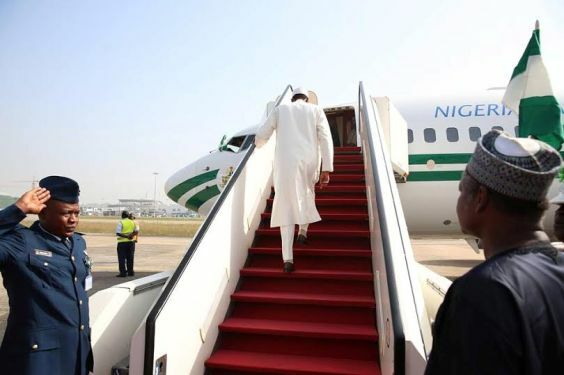 President Muhammadu Buhari leaves for London on Sunday night for an indefinite medical follow-up. This is coming 57 days after the president returned to the country after a 49-day medical vacation in London. Femi Adesina, presidential spokesman, in a statement said the president has already written to the leadership of the National Assembly intimating them of the trip. He said the president had planned to leave Sunday afternoon, but decided to tarry a bit, due to the arrival of 82 Chibok girls who arrived Abuja earlier in the day. The girls, kidnapped in April 2014, were released by the Boko Haram in a swap deal that also saw the release of some terror suspects. Vice-President Yemi Osinbajo will resume in acting capacity as president, as long as Buhari is away, Adesina added. “The length of the President’s stay in London will be determined by the doctors. Government will continue to function normally under the able leadership of the Vice President. “President Buhari has transmitted letters about the trip to the Senate and the House of Representatives, in compliance with Section 145 (1) of the 1999 Constitution,” the statement said.